Since its creation after that spring concert, Buffalo String works has been providing bi-weekly violin lessons for Buffalo school children, immigrants, and refugees, displaced from around the globe. Instructors are experienced local music teachers and violin performance students from the University of Buffalo. On Sunday, December 13th, my wife, Maureen and our three grandchildren and I had the opportunity to attend BSW’s Holiday concert. 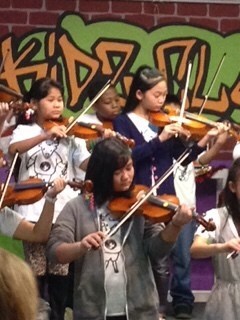 The students beautifully performed six numbers on violin. For the final number, Canon in D, the young violinists were accompanied beautifully by Isaiah Grisha Day on Cello. I have to say that hearing these kids, representing eight countries from around the globe, and having participated in the program for as little as three months, play Beethoven’s “Ode to Joy” was remarkable and moving! Capping off a memorable experience after the concert, all in attendance were invited to enjoy snacks prepared and contributed by the families of the young musicians. The SAMF recognizes and applauds the fine work of BSW. Moreover, we want to do whatever we can to support BSW so that they may expand their efforts and positive impact throughout our community. As BSW is planning to expand their lesson offerings to include cello, the SAMF is very pleased to announce that we have approved the purchase of two cellos that we will be donating to their organization. The lessons provided by BSW, are undoubtedly having a significant, positive impact on the lives of the students, providing them with a sense of belonging in their new community and once again providing proof that music truly is the universal language!